Learn how to rip Spider-Man DVDs for playback on iPad screen. Three years later, Peter Parker finally returns in July with the third Spider-Man movie - Spider-Man: Homecoming. How about the plot of new Spider-Man movie? You can preview some plot summeries from IMDb before watching. As a big fan of this movie, you must have been eagerly awaiting the DVD Spider-Man: Homecoming. And not it's been released. After your purchasing, you must be interested in rip DVD Spider-Man: Homecoming to iPad, iPhone and other popular mobile devices for free enjoyment. 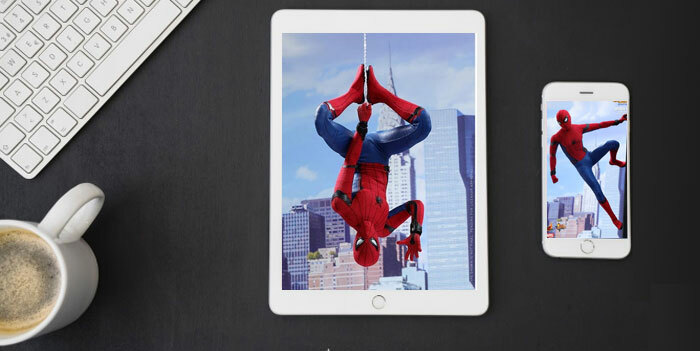 Take iPad as an example, you have to convert Spider-Man: Homecoming DVD to MP4 (H264/MPEG-4) video formats which can be played on iPad, including iPad Air, iPad mini, iPad Pro and so on. In order to play Spider-Man: Homecoming DVD on iPad, you just need a DVD ripper. Various kinds of DVD rippers are available on the Internet. With an improper ripper, you may get disappointed by its incapability to convert DVD Amazing Spider-Man 2 which is distributed by Columbia Pictures and protected with Sony ArccOS. To choose the right Spider-Man DVD to iPad ripper, an important factor must be taken into consideration. Most DVDs are protected by DVD copy protections such as DVD CSS, region code, RCE, Sony ArccOS, UOPs, Disney X-project DRM, resulting in converting issues with some rippers and playback problems on some devices. However, for the qualified DVD rippers, to convert DVD of Spider-Man: Homecoming, Amazing Spider-Man/2 to iPad is as easy as ABC. Among the top multi-functional DVD rippers, there is one reliable Spider-Man DVD ripper which can satisfy all your DVD converting needs: WinX DVD Ripper Platinum. This ripper enables you to convert DVD Amazing Spider-Man 2 to H264 and MPEG-4 for playing DVD Spider-Man on iPad, iPhone (Xs/Mac), Android and other mobile devices with fast ripping speed and excellent output video quality. What's more, it supports all the DVD copy protections, including DVD CSS, region code, RCE, Sony ArccOS and even Disney DRM. It gives you the freedom to convert The Amazing Spider-Man 2, Guardians of Galaxy, X-Men: Days of Future Past, Dawn of the Planet of the Apes, The Hunger Games: Mockingjay and other popular DVD movies to iPad as you like. Download WinX DVD Ripper Platinum and install it on Windows OS (Windows 10 also compatible). Besides, WinX DVD Ripper for Mac is available for macOS Mojave or lower users. Step 1: Import any DVD of Spider-Man movie by clicking "Disc" button. Step 2: Choose the option "to iPad Video" as the output. Step 3: Choose an iPad type/format on the right hand, such as iPad Pro, Pad Air 2/mini 4. Step 4: Click "Browse" button to specify the destination folder where you want to save the output video. Step 5: Hit "RUN" to start to rip DVD Spider-Man to iPad friendly video. Tips: While enjoying a smooth conversion which releases you from worrying about all the DVD protections, you can customize the output DVD Amazing Spider-Man 2 video by editing, trimming, subtitling, cropping & expanding. Besides, many other advanced parameters are also available. 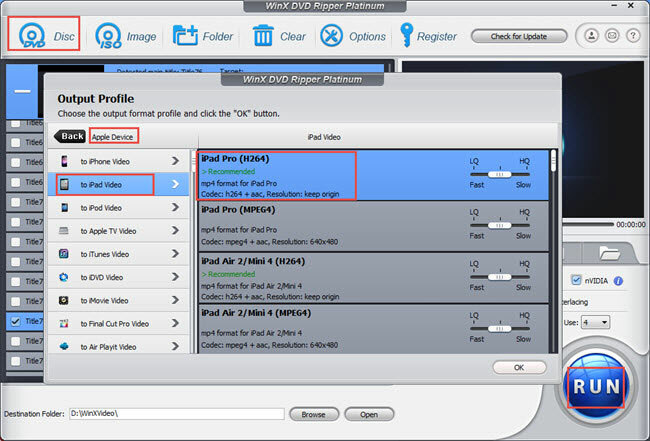 In addition to rip and convert DVD to MP4 (MPEG4/H264) for playback on iPad, Android, iPhone and other mobile devices, WinX DVD Ripper Platinum also features 1:1 Copy function, with which you can copy main/full title content of DVD to MPEG2 file with no video quality loss and 5.1 Channel AC3/DTS Dolby audio. With all the features provided by this software, you can prevent your favourite DVD movies from being damaged or scratched, and enjoy them everywhere with your mobile devices. Here're all the Marvel movies distributed by Disney. Also learn how to download digital copy from Marvel movie DVDs for playback anywhere, any time when you're free. Marvel DVDs adopt the DVD encryption tech., so you should decrypt the copy protection first and then rip/copy/convert Marvel DVD with WinX Marvel DVD Ripper. It also gives a simple A to Z movies download guide for helping you watch best A to Z movies on PC/Mac and portable devices more smoothly.